But it wasn’t your average comic book. 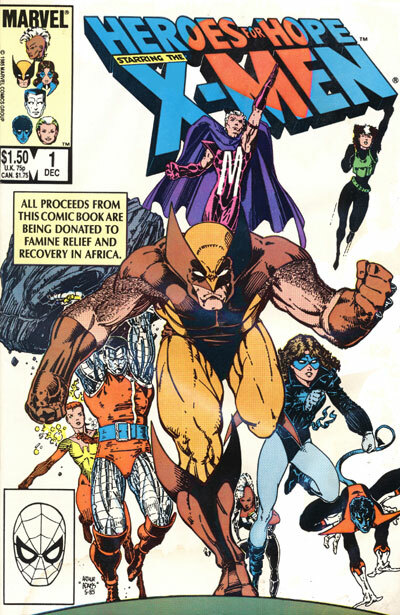 Think ‘We Are the World’ for the comic book industry, or more accurately, Heroes for Hope starring the X-Men. What do you get when you team up Harlan Ellison, Frank Miller and Bill Sienkiewicz on a three-page Wolverine vignette?
. . . I’ve never read this one. That breaks my heart. This looks amazing. I wonder if it’s on Marvel’s Digital Comic Database . . . The issue is kind of disappointing, to be honest. Though the three-page Wolverine segment is a treat. But I did reprint the best part. The cover is truly epic! Thank you for the upload! It is really strange that at one time they considered Wolverine being human before he went through the Weapon X project. I never knew that this was a possible Origin for Wolverine at one time. According to that scan you posted in this thread, the writers intended for Logan to gain the ability to heal when he got the Adamantium bonded to his body. Very interesting to know that Marvel writers had hinted this back then. Thank you DiG. Some really excellent posts on this website, thank you for contribution. “My salad days, When I was green in judgment.” by William Shakespeare.